Fresh lime juice --- 3 tsp. Olive oil --- 5 tsp. White vinegar --- 2-1/3 Tbsp. Shallots, finely chopped --- 1 Tbsp. Fresh coriander, chopped --- 1 Tbsp. Fresh mint, chopped --- 1 Tbsp. In a small bowl, mix together lime juice, vinegar, olive oil, chopped shallots, chopped mint, chopped coriander, TABASCO® Sauce and honey together; set aside. 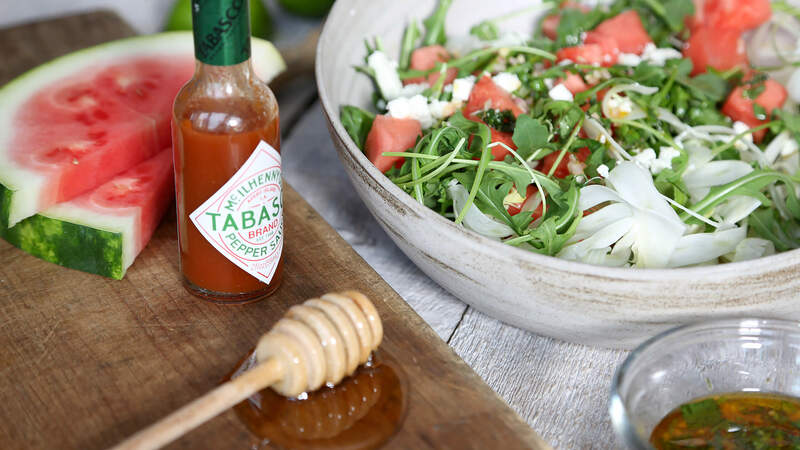 In a serving bowl, combine salad leaves, sliced fennel and watermelon; toss with Spiced Honey-Lime Dressing. To serve, top with the crumbled cheese.